Travis Pickens, OD is an optometrist and has been working in the eye care field since 1994. Originally from Sanford, Florida (just north of Orlando), Dr. Pickens is a graduate of the University of South Florida in Tampa where he received a Bachelors Degree in Chemistry. He received his education and training in optometry from Nova Southeastern University in Fort Lauderdale, Florida. He completed externships in the areas of cataract and refractive surgery as well as ocular disease. In addition to North Carolina, he also holds licensing to practice optometry in Florida. Prior to joining the Wilmington Eye team, Dr. Pickens lived and practiced optometry in Atlanta, Georgia. He worked for a large scale optometric practice and served as the lead doctor for more than 20 other physicians. Dr. Pickens currently manages various eye health issues and is available for comprehensive eye exams as well as emergency services. Though he enjoys practicing all of optometry, some of his peak interests include the management and treatment of both glaucoma and anterior segment diseases. He is a member of the American Optometric Association (AOA) and the North Carolina State Optometric Society. 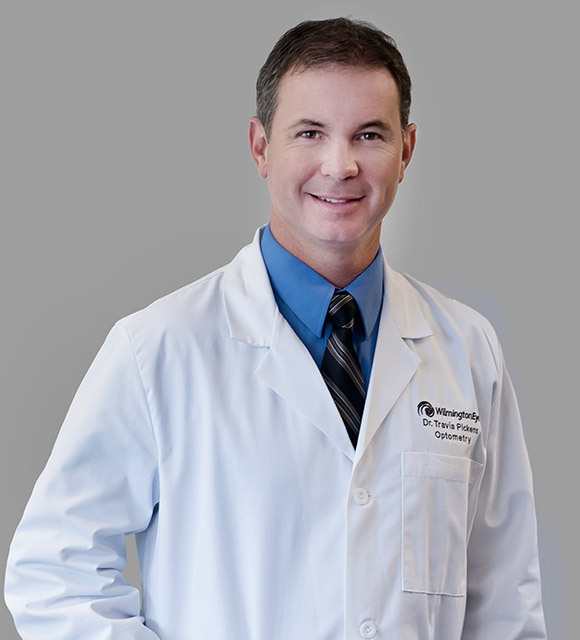 Dr. Pickens enjoys being active in the community in and around Southport. He served as President of the local Lions Club and he also volunteers at the New Hope Clinic. In his free time, Dr. Pickens likes to spend time outdoors with his wife and three children. Some of his hobbies include fishing, scuba diving, and spearfishing.